Rewind to about a month ago: a very heavy package landed on my desk. 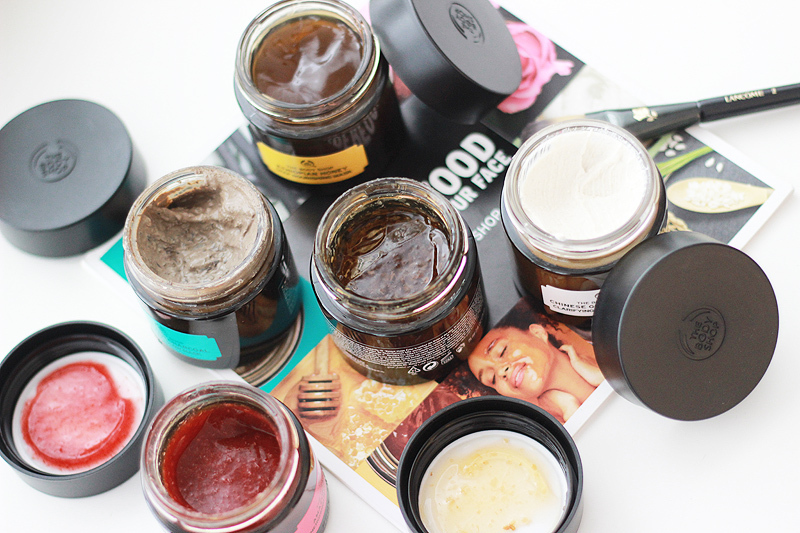 Imagine how stoked I was to find all five new The Body Shop Superfood face masks in there, in a beautiful gift box with an accompanying press kit that explains all about everything. Many brands have bit on a little face mask frenzy lately - it seems like everyone should be slathering masks all over themselves the coming season. And I'll gladly comply! Especially with these ones - they're quite different experience than the others in my beauty cupboard, and that's a good thing. 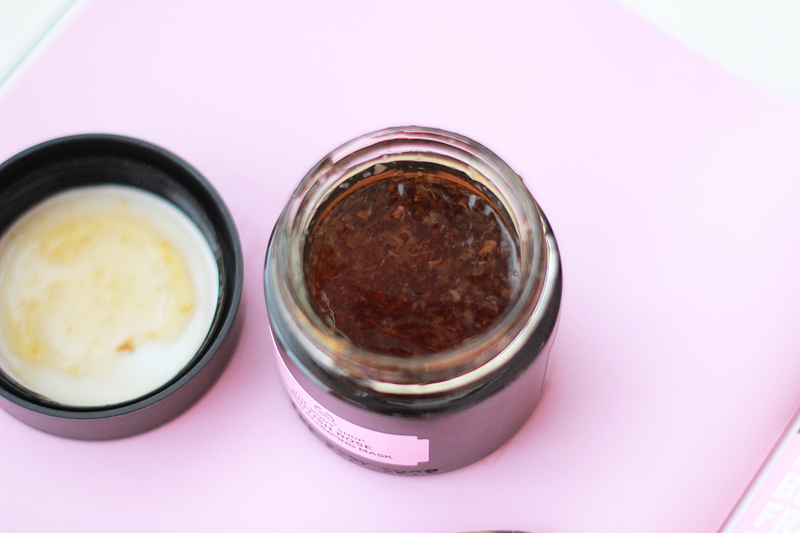 The Body Shop is focusing on superfoods for their mask - and while many of them are probably more of a hype than a true superfood, the approach does make for some delicious face masks. There are five different ones available and they're all vegetarian (with three of them vegan), paraben free, paraffin free, silicone free & mineral oil free. Since I've been listening to The Beauty Brains and other beauty podcasts I have learned to be less impressed about the absence of parabens (as it just creates the need for another preservative), but the other claims are pretty neat. I happily thoroughly tested all five face masks for you, so you know which ones might float your own personal boat. 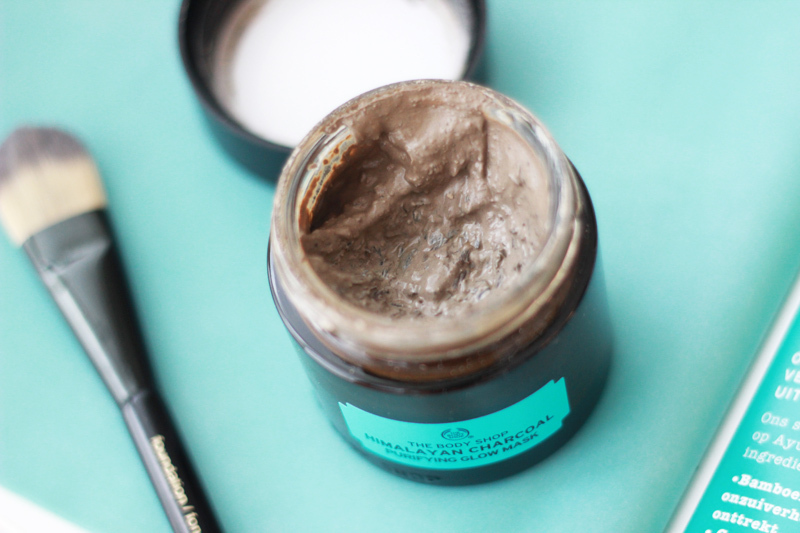 The Himalayan Charcoal Purifying Glow Mask is a vegan stimulating clay mask inspired by Ayurveda traditions. It contains bamboo charcoal, tea tree oil & green tea leaves, along with the traditional clay ingredient kaolin you'll find in many clay masks & Moroccan lava clay. 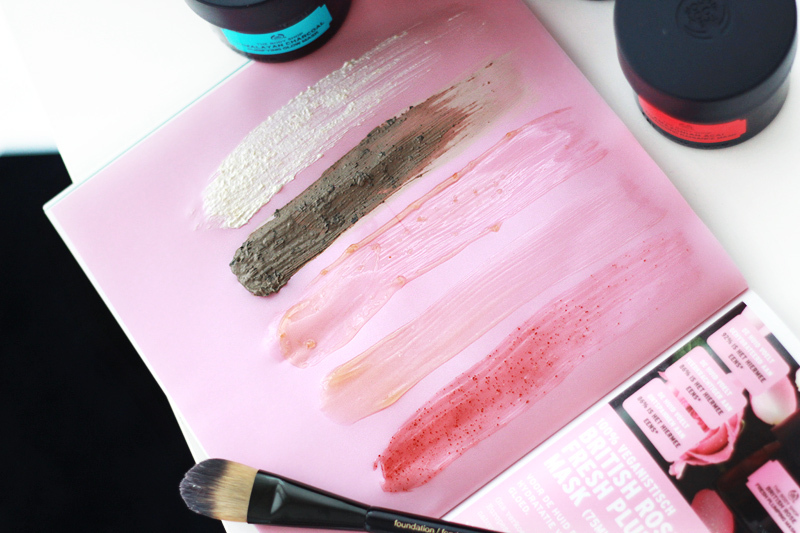 Clay masks are great for greasier skin types, it definitely helps keep the oiliness at bay and can feel so amazing after a full day of makeup. This mask feels very refreshing while drying and is a little tingly because of the menthol & eucalyptus oil, but it's nothing my combination skin can't handle. I do advise some caution with sensitive skin types though! My skin feels very soft and clean afterwards, but I do like to use a moisturising mask after or definitely take care to moisturise properly. The British Rose Fresh Plumping Mask is great to moisturise dehydrated skin - it smells like roses and has a very refreshing gel, jelly-esque texture. It contains rose essence from Britain which replenishes skin, rose petals for ultra gentle exfoliation and rosehip oil from Chile which is rich in omega 3 & 6 and will tone skin. It also contains community trade organic aloe vera from Mexico, which calms and soothes skin. Looking at the ingredients list I find glycerin & propanediol on spots number two and three, which both have great moisturising properties and will leave skin feeling plump and moist. This one is a good option for anyone with dehyrated skin who doesn't like rich or sticky moisturising products: the light weight jelly-like texture is really nice and refreshing and not too heavy. Ohhh this Ethiopian Honey Deep Nourishing Mask.. It's quite luscious. My first impression was that it smells absolutely amazing - like fragrant flower honey, not the artificial type of scent - and it looks quite edible too. 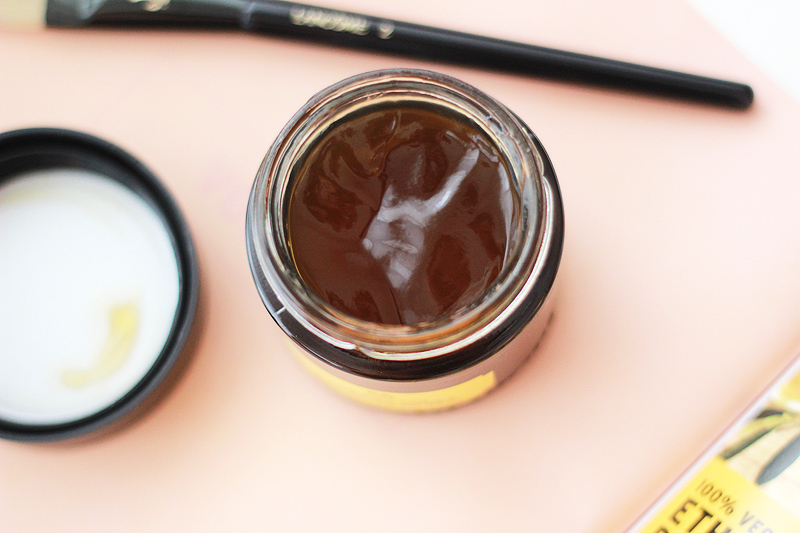 It's not as sticky as real honey when you apply & melts on your skin as it soaks up your skin's warmth. It contains 20% of community trade honey from Ethiopia (the second ingredient on the ingredients list! ), but also community trade marula oil from Namibia & bio community trade olive oil from Italy. 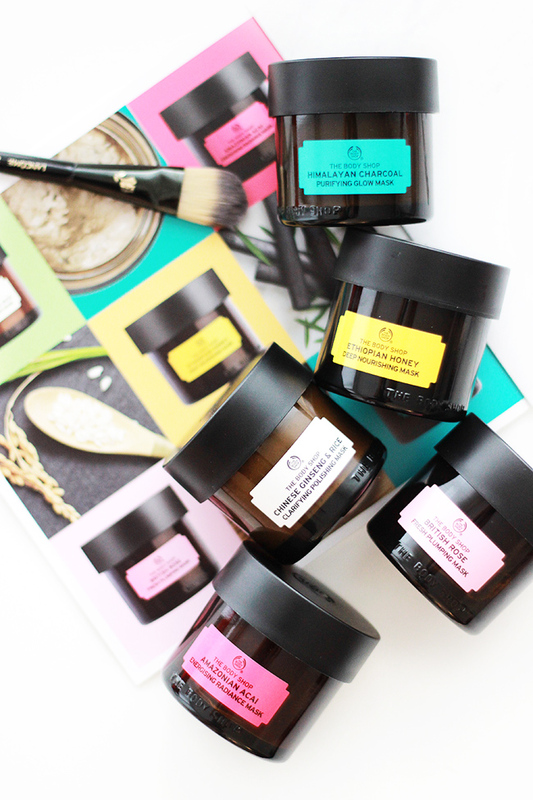 All of these together are incredibly moisturising & will plump your skin. I love to leave this on as long as I can - it especially felt amazing to use after those hot sunny days we've been treated to in Belgium. The Chinese Ginseng & Rice Clarifying Polishing Mask looks the most plain of them all.. But that definitely doesn't mean it's less potent. Checking out the ingredients list I find the white clay kaolin on the fourth place, but also worth checking out is the luffa fruit on the third place. It's not talked about on the website or press materials, but this cucumber-esque plant has exfoliating properties when dried (read: the loofah many of us have in the bathroom) but can also be used in powder or juice form for its detoxifying properties. Although the list doesn't state in which form it's used, my guess is that dried luffa is used for the exfoliating bits here. Other key ingredients The Body Shop lists are ginseng from China which tones the skin, rice extract from China which moisturises and brightens the skin and community trade sesame oil from Nicaragua which will soften the skin. 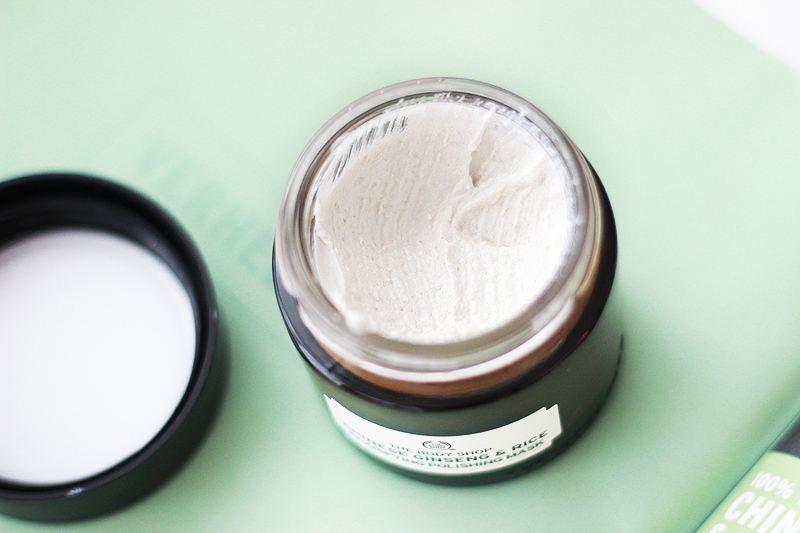 This one is a great clarifying mask for anyone who loves a good scrub mask. 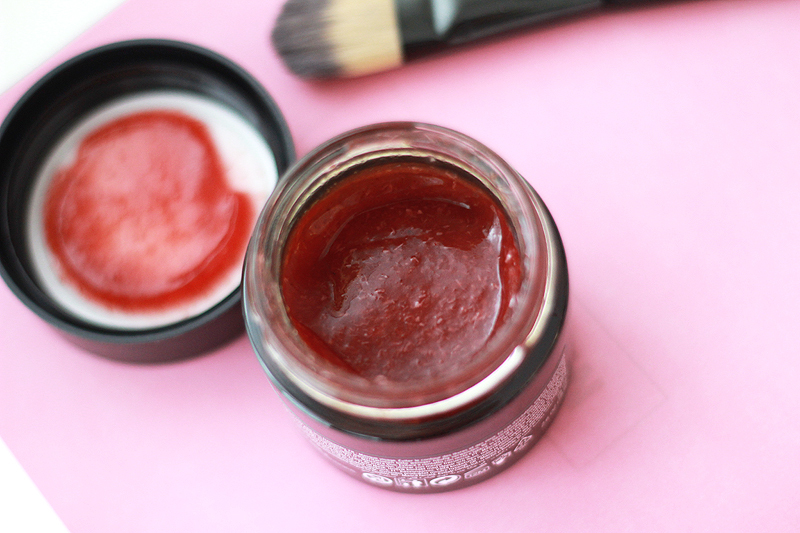 This looks like delicious strawberry jam, but it's actually the Amazonian Acai Energising Radiance Mask. It looks seriously yummy! It contains acai berry from Brazil which is rich in anti-oxidants and vitamins and will fight signs of fatigue, guarana seed extract from Brazil which contains caffeine to boost your skin and community trade organic babassu oil from Brazil which will revitalise skin. This one would be great to use as you'd have your coffee: when you can use a bit of caffeine for a quick pick-me-up. For those of you who'd have the time (and courage) to apply this in the morning before heading to work, or to use on weekend mornings when time is a little more generous. What I like most about this new mask launch is how they're a little different than others - a little more fun, if you will. Their great scent and various textures make for a great sensory experience, while they also promise & show results. In comparison to high end face masks these are very reasonably priced, while being a little more expensive than pharmacy masks. If you're looking for face masks that give you results with a sensory spa-like experience, then these are definitely a very good option to check out in store.